ShedSafe is a new industry benchmark for Australian manufactured steel sheds. 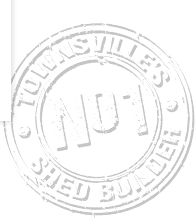 It is an independent accreditation program designed to assist shed buyers in making an informed purchase decision. ShedSafe is a two tiered accreditation program accrediting both the manufacturers responsible for the engineering and design, and the shed sellers responsible for making sure the design is the best fit for their customers. Shed sellers cannot apply for accreditation until their supplying manufacturer has successfully completed their accreditation process. ShedSafe is managed by the Australian Steel Institute and overseen by a Steering Committee comprising of representatives from shed manufacturers throughout Australia. For more information about ShedSafe, visit the ShedSafe website. ShedSafe accreditation cannot be purchased - it has to be earned. Garage World Townsville underwent a rigorous independent auditing and certification process by an ASI appointed panel of independent engineers and specialists. What will the shed be used for - domestic, farm or industrial use? What is the surrounding area generally like - suburban, semi open or open plain and exposed? Garage World Townsville will use this information to determine importance level, terrain category, topography factor, shielding and wind speed in meters per second. This information determines the design strength of the building. Garage World Townsville can supply a range of domestic, commercial and industrial garages, sheds, workshops, awnings, carports and barns to suit your requirements.